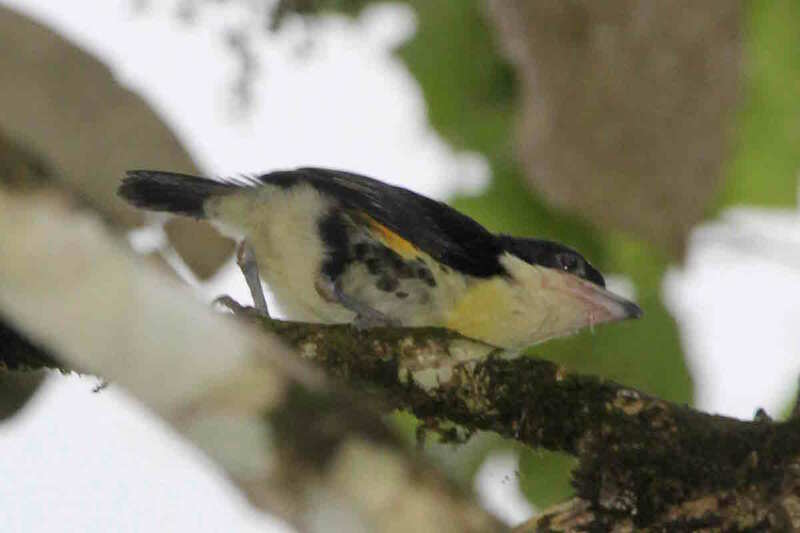 Mariló Castro had been monitoring daily for months an active Spot-crowned Barbet nest in a hole in a dead trunk behind CEASPA's El Tucán Community Center at Achiote, Colón. On June 9 she and I (visiting for the day) were alarmed to find that the nest had been ripped open all the way down one side during the night or extremely early in the morning, and the adult and young birds were nowhere to be found. It was feared a predator had taken them. 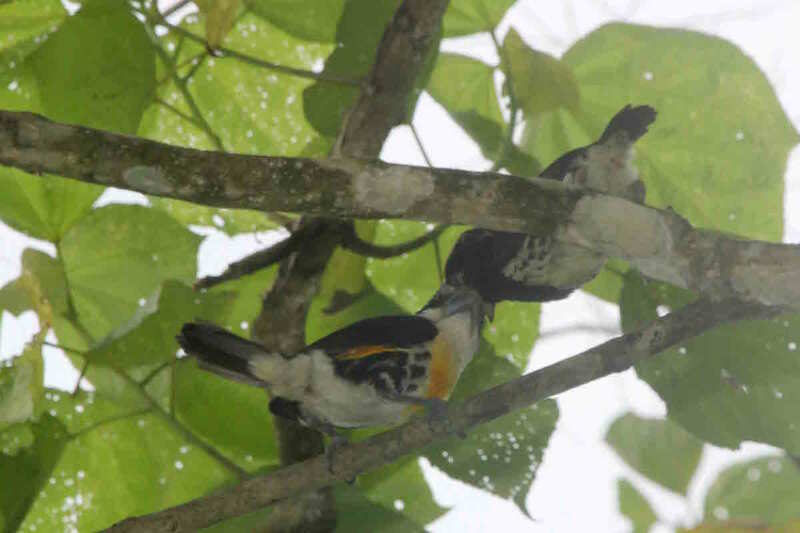 But then a barbet was heard vocalising nearby and we were relieved to find both parents and two fledglings safe and sound in a fruiting tree. One fledgling was in male plumage, the other in female plumage (is this unusual?). 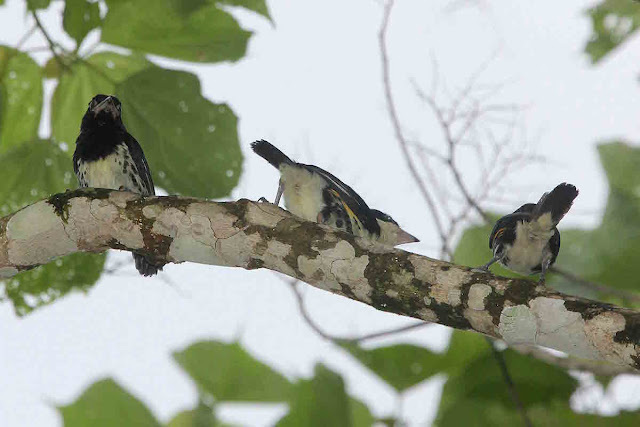 The male parent was feeding the female fledgling (and vocalising) and the female parent was feeding the male fledgling. Despite having left the nest for the first time only a few hours previously, both young birds were jumping from branch to branch and flying strongly and proficiently. 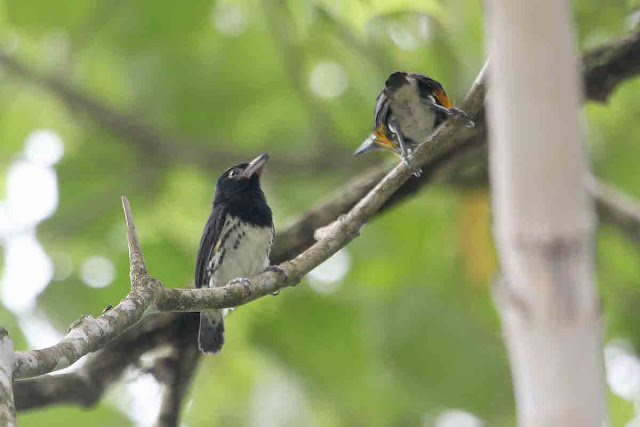 The young male had been seen before peering out of the nest waiting to be fed, but this was the first time the young female bird had been seen. The adult female and young male have not been seen since, but the adult male and young female continue to feed around the Center, especially in the early morning. Hopefully they will remain there for several days to come. The only questions are: where are they roosting now that the nest has been destroyed, where are the adult female and young male (hopefully not far away), and where are they all roosting?